It is one of the glorious Theosophical teachings that worlds, just like men, die and vanish into the invisible. After a period of rest they come forth again and manifest in the visible spheres: appearance and disappearance, the rhythmic pendulum beats of the heart of eternity. Worlds — manvantara; rest — pralaya. Then the same worlds reappear, run through their phases, die, and enter the unknown spaces of space, just as man who is born a little child, lives his life, pursues his karmic destiny, dies, vanishes from earth, and comes back again. So what I am now going to point out would serve equally well for a galaxy, a solar system, a planet in a solar system, or a human being, or indeed an animal or a plant: any individual entity. Let us imagine, then, this cosmic space when all the worlds, solar systems, clusters of stars and what not, have been swept away during the pralaya or death-period of our galaxy. There remains naught but what science calls empty space. Literally it is the lowest plane of spirit, but to us, to our eyes, to scientific instruments, because we cannot see any glittering orbs, we call it empty space. Mother Nature has slept for seven eternities in utter peace. Naught is, that we sense. Now mark: the time comes when a galaxy or a solar system is to make its manifestation after this maha-kalpa or great world-period. Somewhere, anywhere, there appears first a focus of life; let us call it the monad. It does not appear on the physical plane. It is awakening from its long para-nirvana; and it is coming into manifestation in the invisible deeps, the inner worlds of cosmic space. It surrounds itself with a nebula. Now this nebula is called in Sanskrit — and remember we are now talking of monads and not of celestial bodies — this nebula is called a Pradhana, and the monad is called Brahman. In the case of a human being, the monad would be called Atman, and the nebulous vehicle around it, which is not a nebula so much as a veil of living stuff, is called the Buddhi. But in either case, the full birth of the entity proceeds in the same way: by the unrolling of each part or element from the one next above it, until we have the complete sevenfold entity. Nature has one law. She cannot have different, contrary laws working against each other. The following diagram represents the unfolding of the sevenfold entity from the highest, or pure spirit. In the case of either a universe or a human being the other six principles arise from the first and hang like pendant jewels from the first. In other words, out of the divine or out of spirit is born all that is, in a galaxy, in a solar system, in a planet, in a man. Death, speaking in general terms, and applying both in the great and in the small, is the reverse process. What was on the lowest rung or plane is drawn up into the next higher. It disappears. What was in the two lowest is drawn up into the next, and that finally disappears. What was in these three lowest is finally drawn up into the fourth, and that in its turn disappears. All the four lowest are finally drawn up into the fifth and in its turn that disappears. The same process with the sixth; until there remains but the pure monad. The whole of a human being, then, manifesting on this earth, is ultimately from this monad. From atman, the fundamental everlasting monad, eternally a droplet of the Infinite, so to speak, is born buddhi its vehicle; and yet buddhi, although a vehicle, is itself conscious living matter, conscious living stuff. It is spirit-stuff, just as atman is the heart of spirit. Then is born from these two what we call manas, mind, the intellectual power, the root of mentation. From these three is born kama, the principle which impels us to action, the urge to do things, commonly called desire; and it can have a very holy and beautiful aspect as well as a low one. Every man knows that. He has desires in his heart which can be sublime, divine, and desires in him which are sometimes grosser even than those that the beasts show. Then (note the plural) come the pranas, the vitality; that comes from the four above. From all these comes the model body of the physical, the astral body, commonly called the pattern-body on which the gross physical body is builded; and the astral body produces the physical body. To repeat: from atman is born its child buddhi. From atman and buddhi are born their child manas: Father, Holy Ghost, Son. From atman and buddhi and manas taken together and often called the reincarnating monad, springs forth, from their interaction in the manifested world, the principle of desire, the urge to be and to do, to become. And from these four again, from within them, comes the vitality. And from these again is born the astral, model body; and out of all these is the last child, the reflexion on earth of the divinity, of the atman, i. e., the physical monad, which should be an imbodied god, and could be for he has it in him. This is shown by the following diagram. It is useful for showing this and other aspects of man's nature. But if you have studied it for awhile, do not form a picture in your mind of what you have seen here, and imagine that the principles of man are on top of each other like a stair, or a pile of books. The fact is that they absolutely penetrate each other; so that sthula-sarira, as said in the Christian New Testament, actually is the Temple of the Living God, or it should be. The Christians have a marvelous story about the Avatara Jesus going into the temple and driving out the money changers with a whip, because they were degrading the use of the temple. The money changers are our evil thoughts and evil emotions, our evil passions; and the presence of the Christ, the Buddhi, drives them out. All the principles interpenetrate each other. I have tried to show that also in this diagram, as well as the descent of power and faculty decreasing from the top downward. You see then the reason why even the physical man of flesh not only is helped by having within him as it were a reflexion, a radiance from the atman in his heart, but this physical man likewise, because his principles interpenetrate each other, can affect them by running up the scale as it were. You know you can affect your character by your thoughts, your feelings, whether you give way to them or master them; whether you determine to live a life which is grand or one which is the reverse. You affect your whole character thereby, and thus you affect your destiny. You make records running up, as it were, in an inverse direction along these pathways, running right up to the very spiritual heart. Now there is another thing I have tried to show in this diagram: Every one of the seven principles of man is itself septenary. Why? Because it is nature's law that what she does in one place she will do everywhere. Nature is unitary, she has one soul and the action of that soul is uniform. Thus the buddhi-principle in man has seven sub-buddhis. The topmost is a reflexion from the atman. 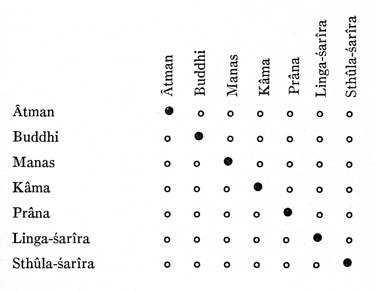 Thus, following along the second column on the diagram, marked BUDDHI, we have first the atman-buddhi; then comes the characteristic of this plane, the buddhi-buddhi; then there is the manas-buddhi, the kama-buddhi, and the prana-buddhi and the linga-sarira-buddhi; and the very lowest of this column is the sthula-sarira-buddhi, yet to us practically pure spirit. Here I want to point out a very important thing. Take the kama, the principle commonly called the principle of desire. Now according to my statement above, there is an atman-kama, a buddhi-kama, a manas-kama, a kama-kama, the particular specialized color or quality or characteristic of that plane, and then the prana-kama . — and so on down the scale. Now what does that mean? It means that even the principle of desire has its atman. You may remember reading in the old Hindu scriptures in the Veda: "Desire first arose in the bosom of IT," speaking of the universal, cosmic desire to be, to manifest. What kind of desire is that? It is atman-kama. And here is another point: It is because the atman is sevenfold that it can unfold itself into the sevenfold constitution of man. The atman, having the buddhi within it, drops a reflexion of its buddhi below, and that becomes the main buddhi. From the atman and buddhi, the buddhi having a manas in itself drops a reflexion of its manas, overenlightened by the atman, and that becomes manas-proper. The manas in its turn, having a kama-manas, or rather a manas-kama, drops a reflexion of it, overenlightened by the atman of buddhi above itself, and you get the kama-proper. And from the kama in the same way comes the prana. And prana is sevenfold. Just as in the man's body there is the life of every cell, the cells of his brain and the cells of his bones and the cells of his blood, which all build one life which penetrates the whole body, so there is the life which penetrates man's whole constitution. There is the life in him which stimulates love. There is the life in him which stimulates devotion, the desire, the yearning to help. There is the life in him which has the kama-principle or desire-principle for lower things, the lowest part of the kama. All these are in man, all interpenetrating. So you see how the atman can unfold or unroll like a scroll and produce a world, a galaxy, a solar system, a planet or a man. This is the picture the Christians gave, taking a statement from the sanctuary, when they said that at the end of the manvantara the heavens shall be rolled up like a scroll. What does this mean? It means that the body will be the first to die and vanish; its component atoms will disappear into their electrons and protons and what not. What is carriable upward will be carried up to the linga-sarira. (In the universe it would be the astral light.) And then this will be the next to die or disintegrate, and what was best in it, including what was best in the one below it, will be carried up to the next higher principle. The scroll is slowly rolling itself up, every principle in turn vanishing, being carried up into the next higher, until finally you have only the last three or the last two, depending upon the kind of pralaya. When a man dies it is the four lowest principles which disappear, disintegrate, break up into their component life-atoms but all that was best in him is attracted up into the manas by the atman and the buddhi. The man, from being sevenfold has become a triad, a threefold being. This is what happens when we men die. But what happens when a planet, the one in which we now live for instance, has its turn to die? Its own manvantara or period of manifestation ends, and its pralaya or rest-time comes. Then what will be left of man is merely the two highest principles; what was in the manas and all the four lower principles will be carried up into the buddhi. Again, what happens when the solar system disappears, its turn having come to die, to go into pralaya? What will then remain either of the solar system or of any man who is in it? Just the pure monad, pure spirit; all the rest has been rolled up as a scroll and gathered into the atman. Now then, to come back to what I first stated: a galaxy, a solar system, a planet, a man, all follow the same pattern. Let us consider a galaxy. 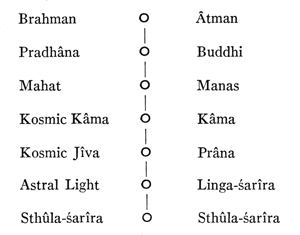 The brahman or the paramatman of a solar system or of a galaxy, which has disappeared, because of having rolled up like a scroll all that was below in its preceding life, contains within itself all the karmic seeds of that past manifested period: all the seeds, the thought-deposits, the spiritual energies in their nirvana, the bosom of the atman. Now comes the time for manifestation again. A point appears in imbodied space — the inside worlds of "empty" space please. What rolls out of the paramatman in the unfolding scroll of the new manvantara is called in Sanskrit Maha-buddhi, which contains the secret things which have been in the past and are now resting as seeds, to produce the future worlds. They begin to unroll themselves and become the mahabhutas or the great cosmic elements. Isn't this exactly the same that happens to a man after his devachan? After he has died and has had a period of rest in the devachan, the monad in the bosom of atman slowly begins to unfold. It is like an unrolling scroll expressing what karman has written on that scroll, expressing what the man has within himself. He begins to reproduce himself, as he leaves the devachan and descends into imbodiment. He unrolls himself into a seven-numbered constitution; and when this has reached the linga-sarira the infant's conception has taken place. When the child is born, then you have the sthula-sarira; and you have a seven-principled human being. Rebirth is the coming out of latency into activity of what has been laid up in the higher principles when the last death took place. Death is the passing away of these temporary lower things, the rising of all that was best and noblest in them into dormancy or sleep or peaceful dreaming, into the triune monad. Rebirth, as stated, is the reverse process, the unrolling, the three becoming the seven. At death the seven rebecomes the three. — Address to the Headquarters Lodge, Point Loma, California, April 7, 1940.